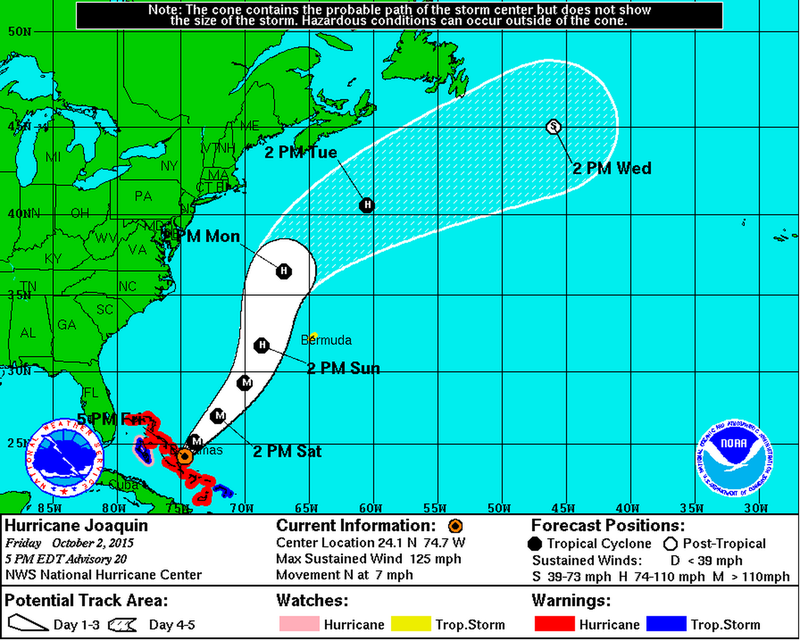 Hurricane Joaquin in the Caribbean on Wednesday. UPDATE (Oct. 2, 5:52 p.m.): According to the latest forecast from the National Hurricane Center, at 5 p.m. Friday, Hurricane Joaquin is expected to stay out to sea. 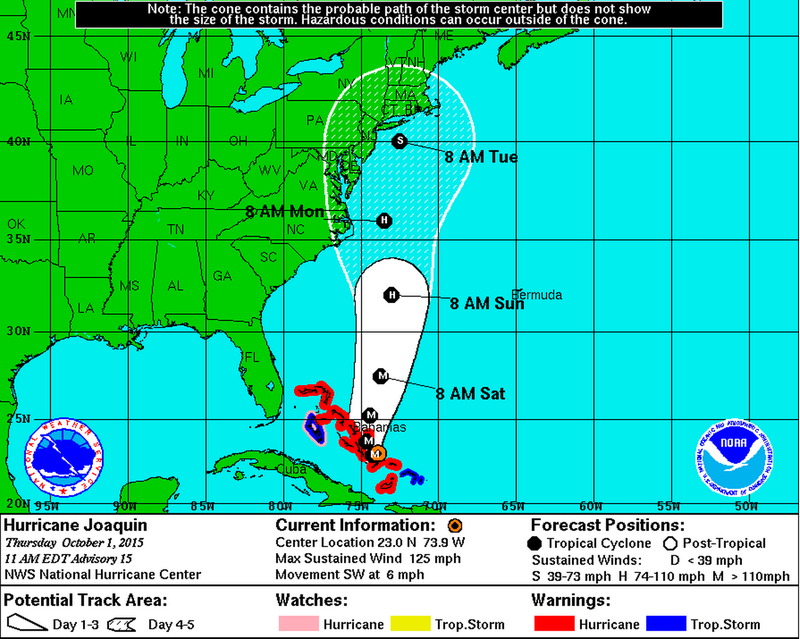 The odds are that Hurricane Joaquin, now lingering 175 miles east-northeast of the Bahamas, will hit somewhere along the U.S. coastline some time in the next five days, but there’s no guarantee. The path of this storm is more difficult to forecast than that of most hurricanes. The National Hurricane Center forecasts the storm to make landfall along the North Carolina coast on Sunday, but there’s a wide “cone of uncertainty” (in weather forecasting parlance) around that projection. 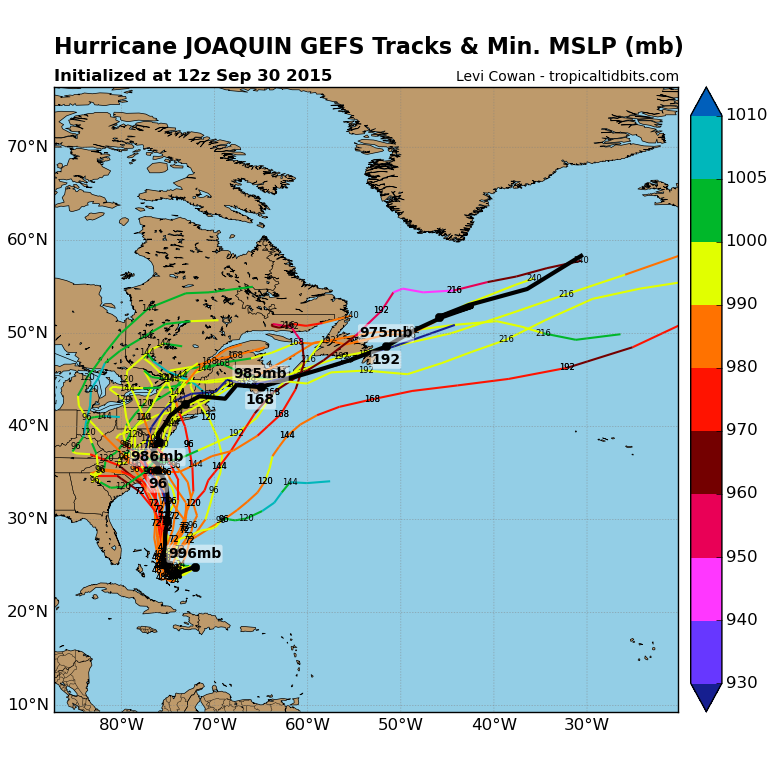 The spread of the GFS ensembles (models re-run with slightly different initial conditions because we can’t measure initial conditions perfectly) include a number of scenarios where Joaquin veers out east, farther into the Atlantic Ocean, and never makes landfall. The European Centre for Medium-Range Weather Forecasts (Euro), which correctly predicted Hurricane Sandy’s path, has Joaquin staying out at sea as well. But the majority of global and hurricane models have the storm hitting the southeast U.S. coast late this weekend or early next week. Indeed, there are good reasons to expect the storm to hit the U.S. We have high pressure blocking the storm’s path over the northwest Atlantic Ocean (see the solid red line on the map below from New York Metro Weather), according to meteorologist John Homenuk. That high pressure could push the storm into the coast. 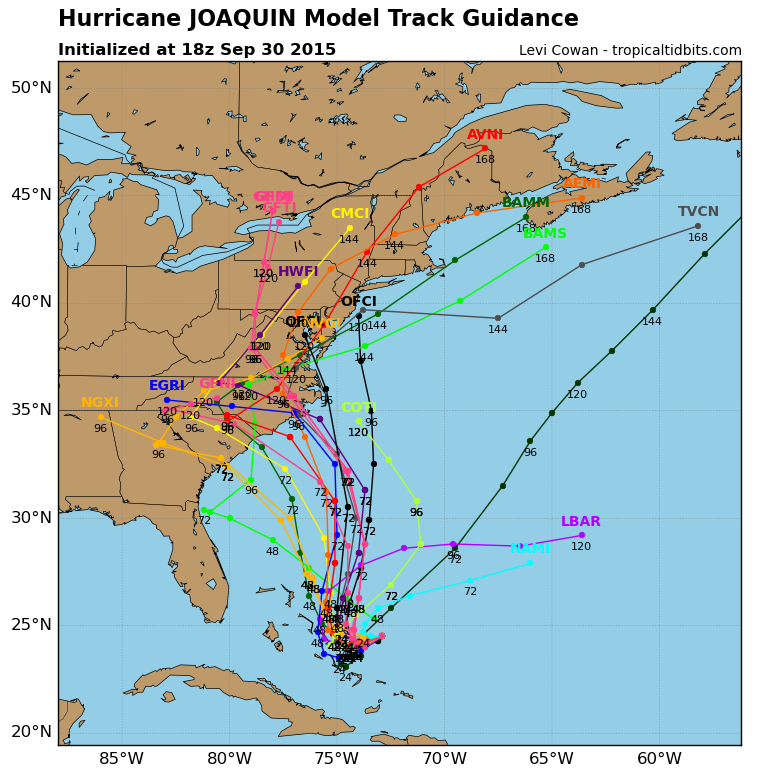 Without it, Joaquin could “re-curve out to sea,” according to forecaster Ian Livingston of the Capital Weather Gang. He said most storms that have made it this far north have gone back out to sea rather than making landfall. Both Homenuk and Livingston also noted an incoming area of low pressure (red arrow on the map above) coming out of the southeast U.S. that could help draw the storm into the coastline. But here’s the problem: The hurricane models don’t necessarily have a good grip on either the “blocking” (that high pressure preventing the storm from turning back to sea) or the “trough” (the low pressure drawing the storm toward the coastline). Homenuk told me that the models can “struggle with the intricate details of this blocking.” They aren’t used to seeing high pressure this strong in the Atlantic this time of year, and minor changes in blocking can make a major difference in the track of a storm. 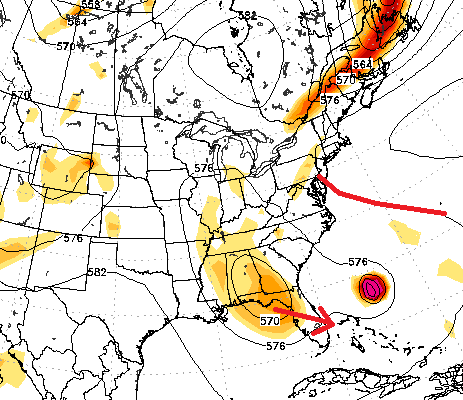 Livingston said the models that show Joaquin coming into the coast, such as the GFS, have the storm “sufficiently captured by the incoming trough.” That means they predict that the low pressure pulling it in to shore will prevail. Model outcomes such as the Euro, on the other hand, have the storm too far south for the trough to drive it back into the coastline. The safest bet for now is to keep an eye on the National Hurricane Center’s forecasts.